PPG Coatings Services not only delivers the industry’s most comprehensive range of technologies, we systematically support them by providing value-enhanced services delivered by expert professionals. We offer a variety of industrial metal finsihing services performed by our professional team. Click on the links below to discover all the ways we can help you manage, sustain and grow your business. 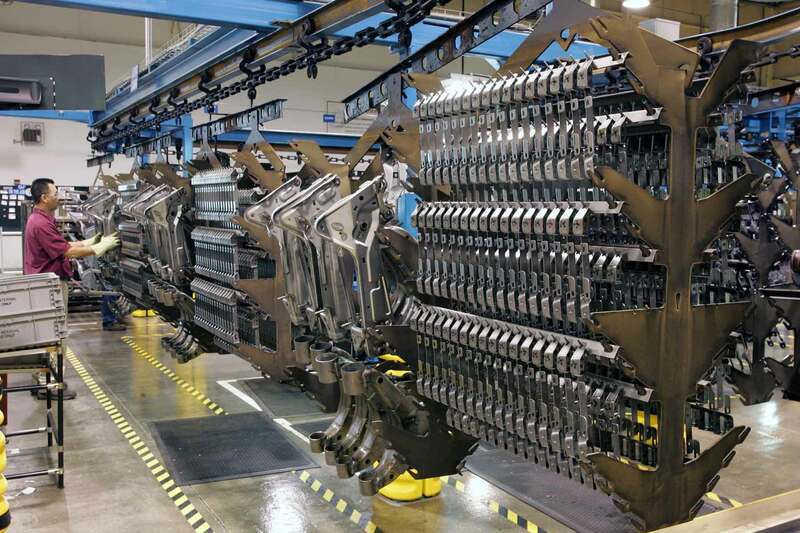 More industries than ever before are selecting electrocoating for their excellent finish quality, high productivity, cost-effectiveness, high-efficiency and versatile technology options. No company has done more to develop and refine this technology than PPG, which means no company is better equipped to deliver an “environomic” coatings solution that meets your most challenging environmental, economic and performance requirements. PPG Coatings Services applies powder coatings in a vivid spectrum of colors, thicknesses, textures, edge coverages and temperature ranges with varying levels of flexibility, smoothness, softness and machineability. Current formulations include acrylic, epoxy, nylon, vinyl, polyester TGIC, polyurethane, with more to come. PPG Coatings Services applies liquid paint to a variety of products and substrates, including automotive steering gears, drive shafts, and hydraulic motors; truck wheels requiring special colors; tractor chassis assemblies; as well as assembled machines. We also finish automotive exhaust system components with a special high temperature-resistant liquid paint. The various liquid paint applications available through PPG Coatings Services are supported by more than a century of accumulated application and engineering experience. A recognized industry leader, PPG Coatings Services not only provides outstanding, high-quality customer service, it also maintains an in‑house Equipment Division offering a full range of support capabilities not available through competitors. The Equipment Division is unique in its ability to combine vast technical expertise, experience and equipment design under one roof. That not only enables our staff to engineer and custom-build turnkey production lines that meet the specific demands of your business, it also gives us the capability to continually monitor your equipment and seek additional efficiencies that maximize lifetime performance. PPG Coatings Services operates a state-of-the-art system for applying an aluminum adhesive-bonding surface pretreatment, a process that enables aluminum components to form an extremely heavy-duty, corrosion-resistant bond with the structural adhesives used in aluminum-intensive vehicle designs. Combining our core expertise of coating application with value added offerings such as injection molding, assembly and packaging, PPG provides the Southeastern region of the United States with a “one stop shop” for the molding and painting of Class “A” plastic components. DragonHide polyurea combination, delivers parts with superior corrosion and vibration resistance. PPG Coatings Services offers supplemental solutions that help customers streamline processes, save time and reduce logistical costs by bundling services with one reliable vendor. Whether you need custom labeling, light assembly, packaging and shipping, automotive foam application or another type of specialty service, count on PPG Coatings Services to get it done right.